Johnny Pro Enterprises printed this 28-card Orioles set during Baltimore's amazing run of five AL East titles in six years (1969-1974), a great era for the hometown fans. Brooks Robinson anchored 3rd throughout, appeared in 15 straight All-Star games (1960-1974), captured 16 straight Gold Glove awards (1960-1975), and wore their (since-retired) #5, making him an ideal fit for the type collection. You can punch out both picture and stand to create an array of 5" tall players, but most cards still in the hobby remain like today's example, un-punched and flat. 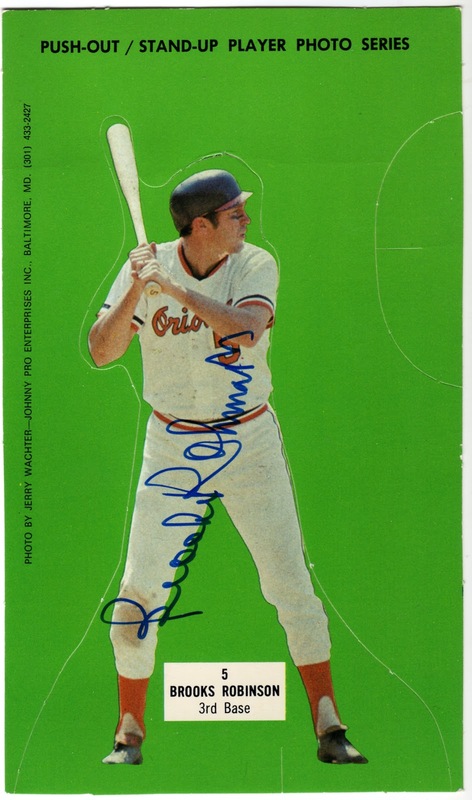 This blog profiled Johnny Pro's other Brooks Robinson card, the "fielding" variation that better fits his reputation, in Feb 2010. 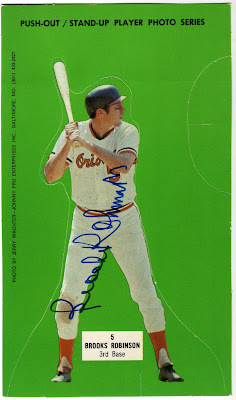 Check it out at 1973 Johnny Pro Orioles #5. Value: I found this card, autograph and all, on eBay for $10. Brooks signs anything and everything you put in front of him (or so I've heard), so chances are that's a legit sig. I have quite a few, and they generally don't command the kind of dollars to warrant forgery. I agree with Beardy, Brooks signs everything and that looks like a few that I have. I really like the side view showing his short brimmed helmet. Very unique!